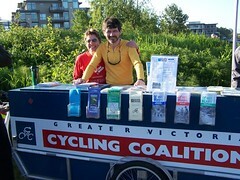 The Greater Victoria Cycling Coalition has sent out a questionnaire to all council candidates. They are making the answers available online, but I thought I would post them here as well. 1. Do you ride a bicycle? 2. Are there any changes that could be made to cycling infrastructure that would encourage you personally to ride more often, or more year-round? Although there aren’t any changes that would make me ride more, it would be a nice to have a little rain. 3. If never, are there any changes that could be made to cycling infrastructure that would encourage you to start riding? 4. How would you rate existing bicycle facilities in your municipality? 5. What are the greatest weaknesses in your municipality’s cycling infrastructure? What needs to be addressed immediately? In the next 5-10 years? Our greatest weakness is our lack of facilities that make cycling comfortable for all users, not just the strong and fearless. Thankfully the PCMP has addressed this, by creating a plan that caters to all levels of cyclists. Within the next year, I would like to see the CRD and the municipalities agree to the strongest funding level, which includes the creation of an active transportation office. Within the next 5-10, we should have the recommended level of separation of facilities on all of the Primary Intercommunity Network defined in the PCMP. We also have a pair of part-time bike lanes, on Henderson and on Cedar Hill X Rd., that need to be converted to full time bike lanes, and no further part-time lanes should be installed. 6. What improvements to cycling infrastructure in your municipality will you promote and support if you are elected? We need more cycling routes,not only on the major routes, but also on quieter parallel streets. We also need more end of trip facilities, especially covered and secured bicycle parking. We need to link into existing bicycle lanes on Fort, and boulevards on Haultain, but also push ahead and leapfrog the City of Victoria and Saanich. 7. If you are an incumbent, what have you done in your last term to improve conditions and/or facilities for cyclists? 8. The Capital Regional District’s Regional Pedestrian & Cycling Master Plan sets a goal of 25% transportation mode share for cycling and walking. Do you support the CRD Master Plan? 9. Which parts of the CRD master plan would you work towards implementing during your next term? As much of it was possible. I strongly support not only working on the various infrastructure projects, but also the creation of an active transportation office at the CRD. Hopefully we will see a good portion of the regional gas tax money in the next few years going to working on various aspects of the PCMP. 10. Are there any changes to the bylaws or bylaw enforcement in your municipality that affect cyclists that you would recommend? 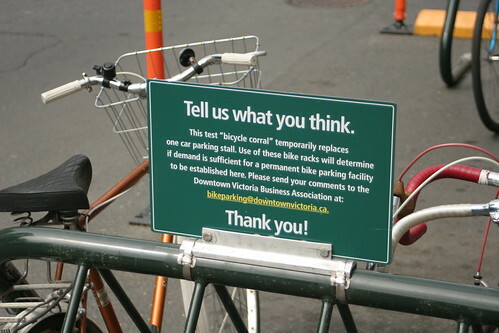 The parking bylaw needs to be changed not only to require bicycle parking (including work on making certain that that parking s installed correctly, as City of Victoria is working on right now), but also changing the motor vehicle parking minimums. Oak Bay also needs to have a policy so that in all new road construction, more vulnerable users such as pedestrians and bicyclists are considered before cars. 11. Do you see any potential for cycling tourism in your community, and if so, how do you see that evolving? Oak Bay has part of the Seaside Touring Route, but also has many destinations that make cycling tourism very attractive. We need to work to make certain that various destinations have attractive and safe routes to them, but also have end of trip facilities at them most recently, partially at my urging, the Kiwanis Club of Oak Bay installed new bike racks near their Tea House in Willows Park, which massively expanded the amount of bicycle parking at Willows. Bike corral on Fort St.
For those that bike downtown, there is a welcome new sight: more bike parking. The Downtown Victoria Business Association has been partnering with the City of Victoria, Bike to Work Week Victoria, Capital Bike & Walk, and the Greater Victoria Cycling Coalition to test out “bike corrals” — essentially bike racks bolted straight into the pavement with a few concrete and plastic barriers (DVBA press release May 27th- PDF). 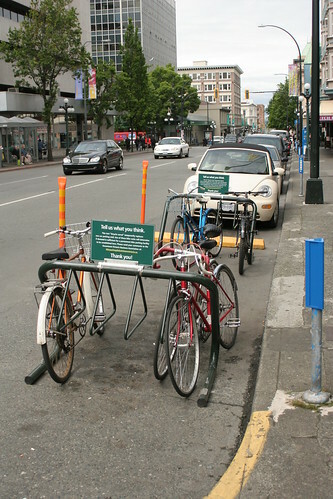 Cheap and easy to setup, bike corrals are perfect ways to add more bike parking quickly, so it is not surprising that they are used all over the world. Closer to home, the Portland city government has been rolling them out as fast as they can in response to business demand. Here in sunny Victoria there are currently just two in commission: one (in the picture to the right) is in the 700 block of Fort St. by Shavers Hobbies, just east of Douglas and the in the 600 block of Johnston St. across the road from MEC, east of Government. Both seem to be fairly well used over the past few weeks, so I expect to see more appear very shortly. After all, over 30 businesses expressed interested in removing a car parking spot in front of their business to adding bike parking (DVBA press release April 14 – PDF). But don’t just use them. The DVBA and their partners are looking for feedback, so email them and tell them how much you love them. It has been a long time since I last posted, but I haven’t been any less busy. 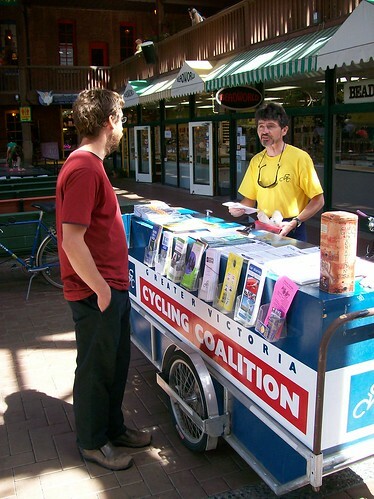 Today was case in point, as I helped out with the Greater Victoria Cycling Coalition‘s “booth” at the MEC Bikefest in Market Square, one of many that MEC plans to hold across the country. Aside from the GVCC, on hand were the Pedal to Petal composting people, Moksana Yoga, South Island Mountain Bike Society (SIMBS) and bunch of smaller outfits. Like any good bike event, free tuneups were had, this time by no less than three different groups, including MEC itself. This begs the question whether MEC will get into selling bikes, to which the answer is “it depends”. Speaking with an MEC staffer, here in Victoria we are unlikely to see MEC enter the market anytime soon, due to lack of staff and space, not to mention the massive amounts of competition already here. However, you can already buy bikes from their Vancouver & Toronto stores, with more on the way. All in all, we had a blast. The weather was great and lots of people stopped by, including one of the people from the Santa Barbara Bicycle Coalition who was making his way back down the coast by bike. You can see more pictures in my 2009 MEC Bikefest Flickr set. See you all tomorrow at the Organic Islands Festival. The GVCC is looking for people to help at their mobile information booth, otherwise known as “the whale”, probably because it handles something like one. At least 4 volunteers are needed, although the more the merrier. As with the Canada Day event, they are looking for people to help out at with “the whale”. This is MEC’s first event of its type and is designed to attract the bicycling members of MEC. This is a great opportunity to connect with this potential membership base. At least 4 volunteers are needed, although the more the merrier. If you are interested in helping out with either of these events, contact Darren Marr at dkmarr@shaw.ca by Saturday the 28th. 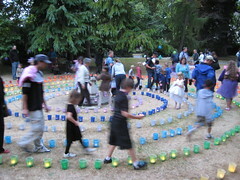 The Luminara people are looking for more volunteers to help out with setting up and taking down the lanterns as well as other work. If you can’t volunteer on the 25th, there might be spot still available in the days before. Contact Audrey Deutschmann at volunteer@luminaravictoria.com or 250.388.4728 ext. 130. They are looking for people to marshall foot and bike races. You need to be there by 7am, so this is one for early birds. Email info@scmt.ca or call 250.592.6211 for more information. If these events don’t do it for you, Volunteer Victoria’s Volunteer Database is the clearinghouse for all sorts of interesting volunteer jobs, both this summer and ongoing. Have fun and happy volunteering!